DSS records harvest of high profile criminals – Royal Times of Nigeria. 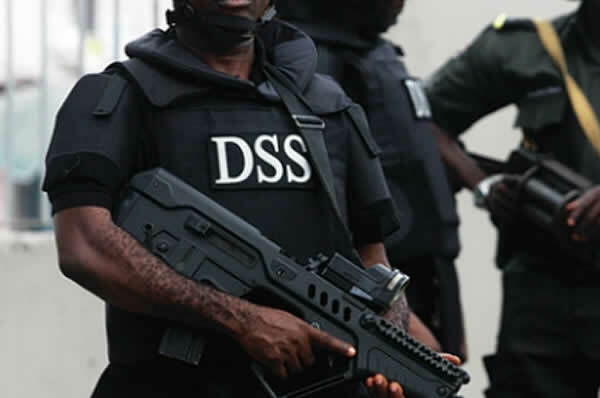 The Department of State Services (DSS) on Monday alerted Nigerians of the burst in high profile criminal cases, including the arrest of associates of notorious kidnap kingpin, Terwase Akwaza (aka Ghana). DSS said that the Dondo Orsaa, Terhile Mbaloha and Teryima Ihiambe (aka Clark) were apprehended at various locations within Katsina-Ala local government in Benue State for their sustenance of kidnap operations across Benue and Taraba States. The coordinated operation of June 9, DSS said, led to the recovery of one AK-47 rifle, a 9mm pistol, ammunition and complete set of Army uniform from Orsaa. Also, on 10th April, one Terna Sakpo, an informant to the Akwaza syndicate was arrested around the Army Barracks in Takum in Taraba State. Mr. Tony Opuiyo, the spokeman of DSS, said on Monday that the some of the operations were planned and executed with sister agencies and targeted at kidnappers, terrorists and other high profile criminals. In Edo State on 9th June, at Aviele, Etsako West local government, 15 kidnap suspects led by Lance Corporal Samaila Madu, a dismissed soldier, were arrested. Another member of the gang, Ibrahim Topa sustained gunshot injury in his left leg while he was trying to escape. Similarly, in Ebonyi State, one Chinonso Onwe (a.k.a Abino Flash) was arrested at Izhia Community, Ohaukwu local government on 1st June for alleged robbery and kidnapping. The suspected, also identified as a member of the Black Axe confraternity, was arrested with two locally made pistols and a pair of Nigerian Army fatigue. Opuiyo said in a statement that prior to these arrests, DSS, in collaboration with the military, on 11th May, 2017, at the Kano State stretch of the Falgore Forest, arrested five suspected Kidnappers and Cattle rustlers. They are Sani Hassan (aka Ashana); Suleiman Abdullahi (aka Dogo Sule); Bashiru Abdullahi (aka Lamo); Amadu Abdullahi (aka Mallam); and Auwalu Sanda (aka Maitaru). Also, on 17th May, 2017, in the Port Harcourt Refining Company (PHRC) road, Rivers State, Alesa Abdulkarim was arrested for his alleged involvement in the kidnap of one Mayowa Akinkuade. Similarly, on 19th May, 2017, at Achala Autonomous Community, Obowo local government, Imo State, one Chinyere Onyeanukum was arrested in his connection with the kidnap of one Jennifer Chizitere Anuruo. “Concerned with the plethora of kidnappings on the Abuja-Kaduna Expressway, the Service, on 28th May, 2017, arrested Aminu Aliyu in Sokoto State for the kidnap of Ifeanyi Amos, an Army Captain on 27th May, 2017 along the Jaji-Kaduna Highway. “On 7th June, 2017, the Service also arrested Yusuf Aliyu at Ungwar Danmani, Rigasa, Kaduna-North, for his suspected membership of the syndicate terrorizing users of the Abuja-Kaduna Road. Again, on 9th June, 2017, at Dankande village, Rigachiku, Igabi local government in Kaduna State, DSS confronted a notorious kidnap gang; the leader Isah Baki, escaped with gunshot wounds, but three of members of the gang were arrested. There are Hassan Abdullahim, 22, Abubakar Abdullahi, 27, and Suleiman Abdullahi, 30. On the same day in Nnamdi Azikiwe Express Road in Kaduna, he said that DSS engaged another dangerous kidnap group and arrested Yusuf Sani and Yusuf Adamu and recovered two AK-47 rifles and nine ammunitions from them.